The Safe and Sound pill popper is an ideal easy way to pop medication and vitamins from their blister packaging. 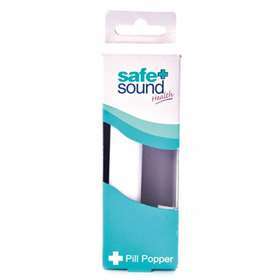 The Safe and Sound pill popper can be used with a majority of blister packs. Place the pill packet in the area between the popper arm and the drop through hole. Ensure the foil of the blister pack is faced downwards. push the arm down to pop the pill. Retrieve the pill by pulling out the storage tray. Keep pills and medication away from children at all times. Do not expose product to extreme physical force or extreme temperatures. Clean product with a soft cloth only. The pill popper should not be used with pills larger than the drop through hole.